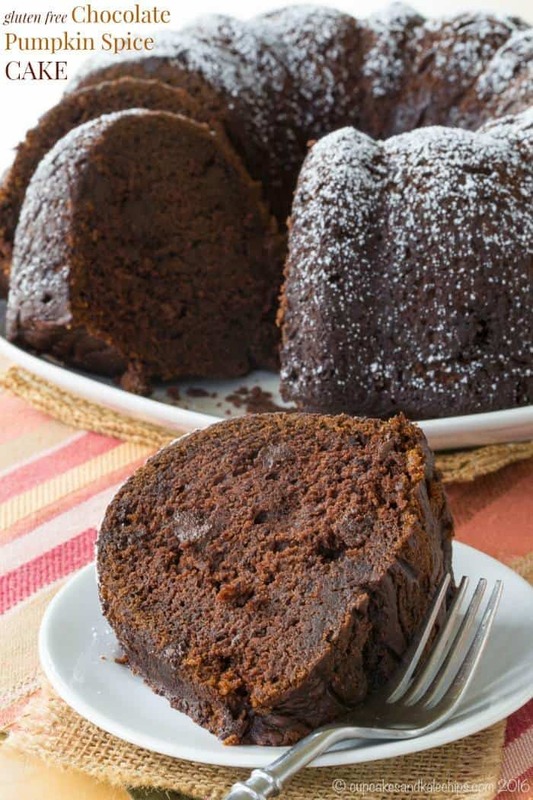 A rich, chocolaty bundt cake that is the perfect fall dessert with a cup of coffee or tea. Top with frosting or chocolate ganache to put it over the top. 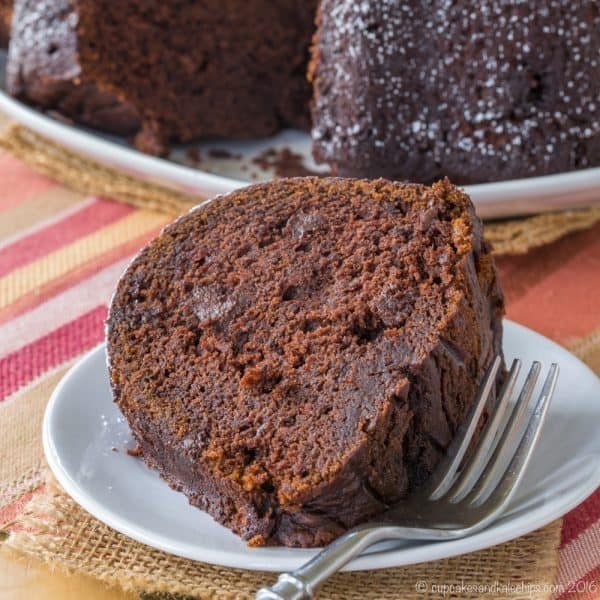 Chocolate pumpkin spice cake is a rich, chocolaty, gluten-free bundt cake that is the perfect fall dessert to share with a beloved friend. Pour a cup of coffee or tea and grab a slice of this chocolate pumpkin cake. It’s one of the best gluten-free pumpkin recipes for Fall! This is one of those posts I just don’t know how to start. Partially because I don’t want to. It’s something I don’t actually want to write because I wish it weren’t true. Last Saturday was my friend Joan’s fiftieth birthday. Only instead of celebrating this milestone in her life, my blogger friends and I are coming together once again in her memory. Joan was the shining light and force to be reckoned with behind the blog Chocolate, Chocolate and More. And if there was anything as big as her love for chocolate, it was her personality, passion, and love. Sadly, her light went out far too soon, when she passed away from a heart attack suddenly last fall, leaving behind three teenagers. Her blog is still going strong with her sister and other bloggers contributing new sweet treats, social media managers and assistants keeping her thriving Facebook page, Pinterest account and more going strong, and an ad company keeping ads running on her page. All of this comes together to keep traffic going to her site and revenue coming in to help support her children and their future. After she passed, I shared this collection of some of her most amazing Chocolate Recipes. But if those aren’t enough, you should also check out some of her other amazing treats (all of these happen to be gluten free) like her Flourless Chocolate Cake, Creamy Fudgesicles, Butter Pecan Crunch Candy, Peanut Butter Fudge Swirl Ice Cream, and Kahlua and Cream Milkshake. Remember, every click on her site helps her children pursue their dreams and be a living legacy of their wonderful mother. The food blogging community still has a hole in it without her. Someone is always saying, “Oh, I learned that from Joan.” or “Joan told me about this.” or “Remember when Joan…” or “That’s something Joan would have said.” That was the lasting impression made by a woman who has left a legacy built on desserts as sweet as she was. Gluten Free Chocolate Pumpkin Spice Cake, based on Joan’s recipe, is the ultimate pairing of fall’s favorite flavor and total chocolate indulgence. The slightly sweet and earthy flavor of pumpkin enhanced by the warm spices of autumn just seem to go so perfectly with chocolate. 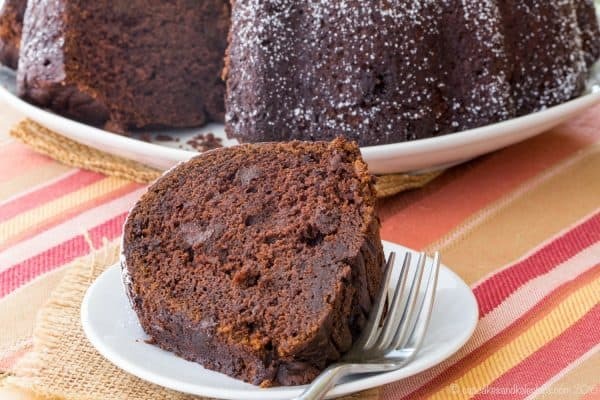 And when studded with chocolate chips for extra little bursts of chocolate, this is a bundt cake recipe worthy of a special celebration. It is so moist and rich that a simple dusting of powdered sugar is all it needs, but you can always cover it in frosting, such as the White Chocolate Buttercream Joan recommended, or a rich chocolate ganache. 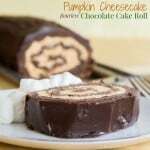 Not gonna lie, I think next time I make it, I’m going to cover it in Nutella ganache, like I put on this Pumpkin Cheesecake Flourless Chocolate Cake Roll. And here’s how things come full circle in the blogging world. As I went through Joan’s recipes to decide which to make, I knew I could just share one of her candy recipes, but I wanted to bring her chocolaty baking awesomeness to my gluten free friends. Plus, you know, fall, so it’s time for all the pumpkin everything, so I knew I had to make her Chocolate Pumpkin Spice Cake. As I was looking for some guidance on how to convert the all purpose flour to gluten free, I’d been perusing (and making several recipes from) The Weeknight Dinner Cookbook from my friend Mary of Barefeet in the Kitchen. I had made the gluten free version of her Chocolate Chip Pound Cake, and I had a feeling the texture would translate well to this bundt cake. So I pulled out the recipe, my pencil, a piece of paper, and my chemical engineering brain that still likes to do unit conversions. It turned out perfectly! And as I was looking again at Mary’s recipe, I noticed her note in the cookbook that she was dedicating her pound cake recipe to sweet Joan. It was just meant to be. And by the way, if you want a pumpkin bundt cake without the chocolate, check out Mary’s Pumpkin Bundt Cake. We miss you, Joan. I would truly love to share this chocolate pumpkin spice cake with you! Powdered sugar, frosting, whipped cream, or chocolate ganache, if desired. Preheat oven to 350°F. Grease and flour a bundt pan, or mix together one tablespoon of shortening and one tablespoon of cocoa powder and grease the pan thoroughly with this mixture. 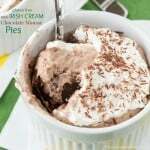 In a bowl, sift together the brown rice flour, tapioca starch, potato starch, xanthan gum, cocoa powder, baking soda, pumpkin pie spice, and salt. Set aside. In a large bowl, add the butter and brown sugar and cream at high speed until light and fluffy. Reduce speed to medium and add the eggs one at a time, beating between each addition, and then beat in the pumpkin. Set at low speed, and slowly add flour mixture to butter mixture just until combined. Pour the batter into prepared bundt pan and spread evenly on the top. Bake for 40-50 minutes until toothpick inserted in cake comes out clean. Let cake cool completely in the pan before inverting to remove from the pan. Once cool, sprinkle with powdered sugar or cover with frosting, whipped cream, or chocolate ganache if desired. Adapted from Chocolate, Chocolate and More, with gluten free flour conversion based on Barefeet in the Kitchen. 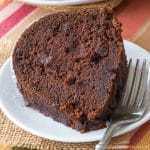 Enjoy this Gluten Free Chocolate Pumpkin Spice Cake recipe! Happy to hear that you enjoyed it, Sarah! I take it you are supposed to add the pumpkin before the flour? It isn’t in the directions. Could you please clarify? Thank you! Yes, Lo. I apologize for the missing information in the recipe. Mix the pumpkin in after you’ve added the eggs. Your cake looks yummy and healthy. Thank you for linking up with us at #HomeMattersParty. See you again next week. What a beautiful remembrance of your friend, Brianne. This cake looks and sounds absolutely delicious. 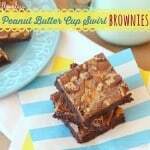 I’ve always loved pumpkin in brownies and the additon of the spices to those flavors sounds amazing! I’ve never used brown rice flour before and I’m really curious to try it! Thanks, Stephanie. I hope you have an opportunity to try rice flour. It’s become a staple at our house! Absolutely felt the same way. I didn’t want to write the post because it made it too real! This cake looks amazing and I think Joan would of loved it!